12,341 tonnes of nickel (9,963) and 29,104 tonnes of zinc (20,995) were produced. Net sales totalled EUR 162.4 million (88.5). EBITDA was EUR 20.9 million (-51.3). EBITDA without change in value of work in progress (WIP) was EUR 4.9 million (-57.5). • 5,920 tonnes of nickel (5,176) and 14,096 tonnes of zinc (11,204) were produced. • Net sales totalled EUR 76.7 million (47.2). • EBITDA was EUR 11.1 million (-32.9). • EBITDA without change in value of work in progress (WIP) was EUR 3.3 million (-24.2). • The value of work in progress (WIP) was EUR 154.0 million (56.3). 5,920 tonnes of nickel and 14,096 tonnes of zinc were produced during the second quarter. The operating result was EUR 3.4 million positive, although a planned maintenance stoppage in May limited production and sales volumes. The project concerning the battery chemicals plant and related power plant advanced from technical-economic feasibility studies to detailed engineering phase. The Environmental Impact Assessment (EIA) advanced from the programme stage to preparation for EIA reporting. By the end of June, the amount of water stored at the site was 1.9 million cubic metres, corresponding to the target level of 1–3 million cubic metres. Despite the spring meltwater, the discharge quota of purified water was not used. Due to a good water balance, no water was discharged from the site during 7–30 June 2018. Mineral Resources and Ore Reserves estimates were updated in June in compliance with the JORC code. According to an independent third party, the measured, indicated and inferred mineral resources amount to 1,525 million tonnes. The mineral resources and ore reserves will enable metals production and further processing for several decades. On 4 July 2018, Sotkamo municipality granted construction permits for two new buildings for the battery chemicals plant. Earthwork construction related to the plant project was started in July. 1) Work in progress (WIP) is calculated based on the cost value as of 31 December 2017. 2) EUR 13.4 million of capital expenditure was allocated to improving productivity and capacity. If the table is not properly displayed, click here. “During the second quarter, the global market price of our main product, nickel, increased whereas the price of zinc decreased. Compared to the previous quarter, the average price of nickel increased during April–June by 9.0% in dollars and 12.5% in euros. Correspondingly, the average price of zinc decreased by 9.0% in dollars and 6.2% in euros. The prices of copper and cobalt continued to be at a good level. Terrafame’s net sales for April–June was EUR 76.7 million and for January–June it almost doubled from the previous year’s EUR 88.5 million to EUR 162.4 million. 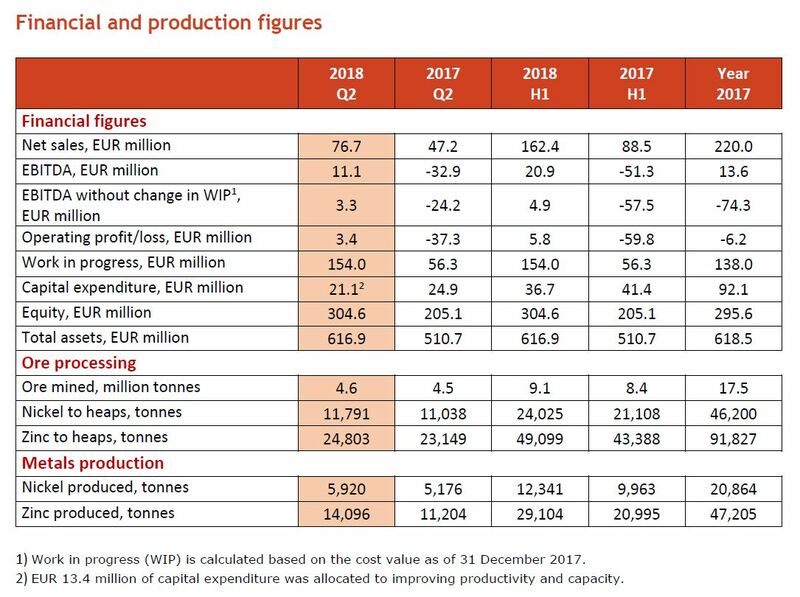 The EBITDA without the change in work in progress was positive during April–June and we continued to increase profitability, despite the maintenance stoppage at the metals production plant which limited production and sales. This was the fourth consecutive quarter with profitable business for Terrafame. The detailed engineering of the battery chemicals plant has advanced according to schedule, along with permit processes and the preparation for excavation work. At the start of July, we were granted a construction permit for the plant and the EIA process is now advancing into the reporting stage. Our next goal is to analyse the technological alternatives for the main processes and continue negotiations on equipment. In addition to nickel and cobalt sulphates used in the batteries of electric vehicles, the plant would produce ammonium sulphate, used for example as a fertilizer. During the second quarter of 2018, the average price for nickel was USD 14,476 per tonne, which is 9.0% higher than in the previous quarter (Q1 2018: 13,277) and 56.9% higher than in the second quarter of 2017 (Q2 2017: 9,225). Key factors affecting the price development included growth in nickel demand in stainless steel production and Asia’s battery industry. In addition, investors’ demand for nickel has increased due to growth in the demand for electric vehicle batteries. The combined nickel stock levels of the London Metal Exchange (LME) and Shanghai Futures Exchange (SHFE) have decreased during every quarter since the first quarter of 2016. During April–June of 2018, the combined nickel stock levels of LME and SHFE continued to decrease by 69,000 tonnes, totalling less than 300,000 tonnes by the end of June (end of Q1: 368,000). During the second quarter of 2018, the average price for zinc was USD 3,112 per tonne, which is 9.0% lower than in the previous quarter (Q1 2018: 3,421) and 19.9% higher than in the second quarter of 2017 (Q2 2017: 2,596). The price development was driven by the weakening demand in the Chinese market and concerns over the development of the global economy arising from the import duties set by the United States on steel and aluminium. The combined zinc stock levels of LME and SHFE decreased again during April–June, whereas the stock levels grew in the previous quarter after having dropped for nine consecutive quarters. Stock levels decreased now by 32,000 tonnes, totalling approximately 330,000 tonnes by the end of June (end of Q1: 363,000). The prices of copper and cobalt continued to be at a good level, although copper declined at the end of the quarter. During April–June, the average price for copper was USD 6,872 per tonne, which is 1.3% lower than in the previous quarter (Q1 2018: 6,962) and 21.4% higher than in the second quarter of 2017 (Q2 2017: 5,662). The outlook for electric vehicle battery production continued to impact the price development of cobalt favourably. During April–June, the average price for cobalt was USD 87,667 per tonne, which is 6.6% higher than in the previous quarter (Q1 2018: 82,246) and 56.1% higher than in the second quarter of 2017 (Q2 2017: 56,155). The price performance of the US dollar was favourable for the Terrafame business. During the second quarter, the dollar strengthened by 3.1% in relation to the euro, compared to the previous quarter. The average rate during April–June was 1.1915 (Q1 2018: 1.2292). Terrafame’s capital expenditure totalled EUR 21.1 million in the second quarter (Q1 2018: 15.5 and year 2017: 92.1). A total of EUR 13.4 million of this sum was allocated to improving productivity and capacity. The most significant capital expenditure items for improving productivity and capacity were the detailed engineering of the battery chemicals plant, construction of the foundations for block 2 in the waste rock area, installation work of the new hydrogen sulphide production line, construction of block 4 in the secondary bioleaching area as well as the development of aeration in the primary bioleaching area. 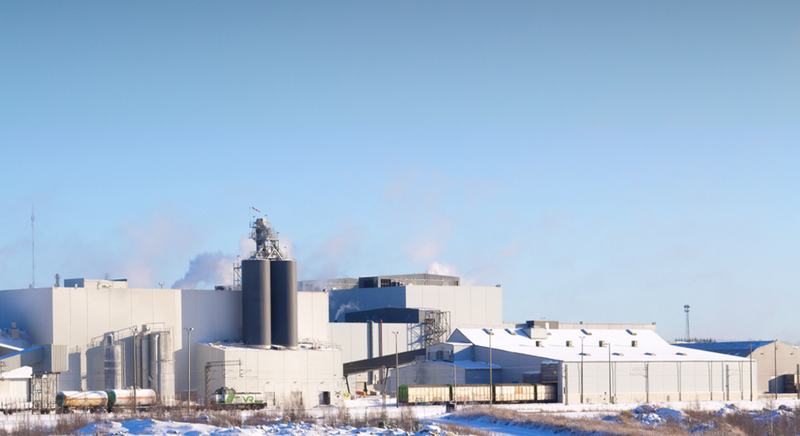 The Environmental Impact Assessment of the battery chemicals plant began in April after Terrafame submitted the project’s EIA programme to the Kainuu Centre for Economic Development, Transport and the Environment (ELY Centre). In June, the ELY Centre issued a coordinating authority statement, based on which the project is now advancing to the reporting stage. In May, the Northern Finland Regional State Administrative Agency (RSAA) granted an environmental permit to the new hydrogen sulphide plant which will increase the capacity of the metals production plant as well as improve the reliability of the plant’s production process. Laboratory research to explore the recovery of rare earth elements and uranium was also continued during the second quarter. Processing of the spring meltwater was carried out with no need to use the full discharge quota granted in the environmental permit. During April–June, a total of 1.4 million cubic metres of purified water (Q2 2017: 1.6 Mm2) was discharged from the site to the northern discharge routes. Both the sulphate load, which was 1,582 tonnes (Q2 2017: 3,012 tonnes), and metal concentrations of the discharge water remained clearly below the permit limits. Thanks to the good water balance, no water was discharged from the site during 7–30 June 2018. A total of 1.9 million cubic metres (Q2 2017: 3.7 Mm2) of water was stored at the site at the end of June. According to Terrafame’s environmental monitoring results, the spring overturns of both Nuasjärvi and Jormasjärvi lakes extended to the entire mass of water including the basins. In June, the Kainuu and North Savo Centres for Economic Development, Transport and the Environment reported that the water quality in several rivers and lakes below Terrafame had improved along with the water routes of Oulujoki and Vuoksi water courses. At the end of June 2018, Terrafame employed 711 people (Q1 2018: 634), including summer employees. In addition, approximately 70 partner companies employing 610 people operated at the site during April–June (Q1 2018: 631). During the second quarter, three lost-time injuries occurred among Terrafame’s personnel. The rolling lost-time injury frequency for 12 months, i.e. the number of injuries per one million person-hours worked, was 5.4 (2017: 3.5). The target for 2018 was to decrease the number to less than 2.5. Terrafame will continue production ramp-up and improving profitability. In the battery chemicals plant project, the company will analyse the technological alternatives for main processes and carry out negotiations on equipment purchases. The EIA process for the project and excavation work related to the plant will also be continued. In addition, the recovery of rare earth elements and uranium will continue to be explored on a laboratory scale. Terrafame Ltd’s financial information for 2018 presented in this release are unaudited FAS figures.